Dr Michael Dixon is an orthopaedic specialist of the lower limb, with a particular interest in arthritis and sports injuries. Experienced in joint replacement and reconstructive surgery of the hip and knee areas, Dr Dixon performs surgery using the latest arthroscopic techniques. He has completed extensive training in all areas of orthopaedics including hip, knee, shoulder and sports medicine through a series of orthopaedic fellowships. Dr Dixon is a member of the Australian Medical Association and Australian Orthopaedic Association and has appointments at Kareena Private Hospital, National Day Surgery, St Vincents Private Hospital and The Sutherland Hospital. Dr Dixon attended Harvard Medical School in the United States to complete specialist training in hip and knee through a distinguished Knee and Hip Fellowship. 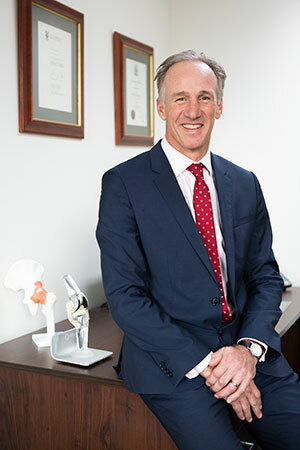 Receiving a Sports Medicine Fellowship at the Australian Institute of Sport, Canberra and subsequently obtaining experience in shoulder and knee surgery and arthroscopy through a Knee and Shoulder Fellowship in Sydney, Dr Dixon is one of the leading specialists in the field of orthopaedics.